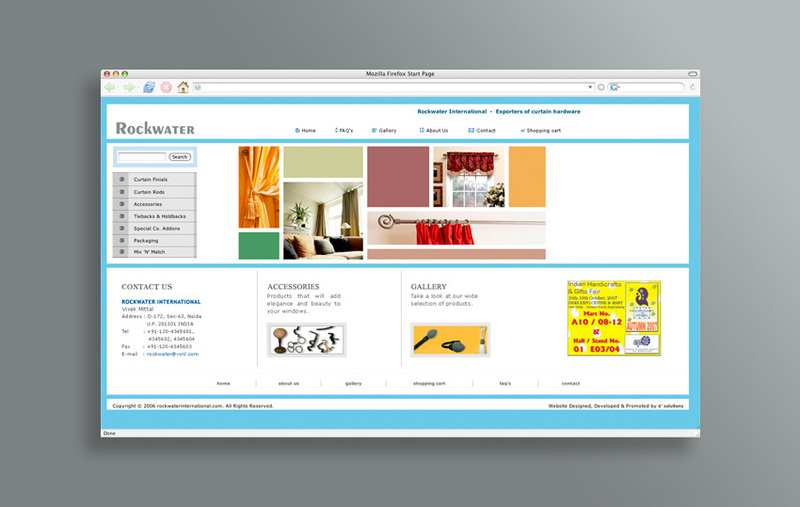 Rockwater International are India's largest hand-crafted window treatment solution providers. Their pioneering decorative window treatments are available at leading stores in over 40 countries across the world. Extend the reach to potential online customers by increasing website exposure via natural search engine listings. Increase online sales whilst generating an enviable return on this marketing investment. Design a website with excellent usability and structure allowing search engine spiders to navigate effectively through the site. Site was re-structured ensuring it is easier for users and search engine crawlers to navigate between the inner pages. Provided manual submission of pages and deep-link submissions of inner pages. Developed a clear strategy for SEO and appropriate tactics to improve rankings for popular terms. Provided comprehensive keyword and ranking analysis and reporting. The website has been consistently ranking on page one of Google for many competitive key phrases such as ‘curtain hardware exporters’, ‘curtain rod exporters’, ‘curtain rod manufacturer’ and ‘curtain final manufacturer’. There has been a dramatic increase in the number of international web enquiries and sale orders since the SEO campaign started. Due to this successful online campaign the client is now channeling a greater proportion of the marketing budget towards future online marketing initiatives.